It is a rainy day and the sky is gray. We are deep in the forest. There are no sounds except bird voice. We drive about one and half hours from Kochi city. There is a beautiful garden called Mone no niwa (“Monet’s Garden.”) This is located in a small village, Kitagawamura in Kochi. We keep driving along the coast to the east. If the weather is clear you can see the beautiful Pacific Ocean. Finally we arrive at the entrance of the Garden. There is a green arch top above our head. “But this is not English” says my friend as soon as she reads it. It is French. This is a French garden. It may seem surprising that there is a French garden deep in rural Kochi. Especially since Kitagawamura is a very small village. About 17 years ago, a young man from Kitagawamura went to France. He was working in the public office in Kitagawamura. They wanted to make a new industry in Kitagawamura so they started the new project. However Kitagawamura is a very small village and 94% of this village is forest. The population was about less than 1,600 people in 2000 and many young people had gone to the city to find a job or study every year. Kitagawamura had and still has a serious problem of decrease population. But on the other hand, there are beautiful nature which is untouched by human. They wanted to use this advantage for new projects so they made an idea which is making Flower garden in Kitagawamura. That makes village more activation. But it looks no similar point between here and France. France is a very big country for art. There are so many artists and large amount of work are created by them every day. The website says that this garden is a collaboration between the natural beauty of Kitagawamura and French art. He was also interested in Japanese art especially Ukiyoe (traditional Japanese prints popular in the Edo period) and he started to collect Ukiyoe when he was 30 years old. A lot of artists took inspiration from Ukiyoe. He was one of them. Especially the color scheme and construction of Ukiyoe affected him. We can see that in his work. 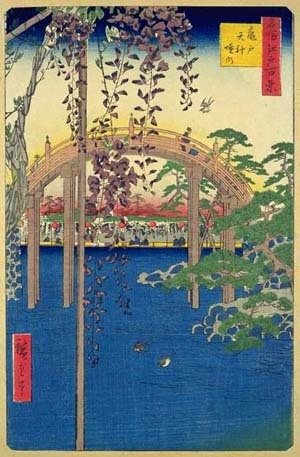 For example in some of his work, there is a Japanese bridge called taikobashi. He also made a beautiful garden in France and mixing in Japanese style such as taikobashi and ponds. Just before he died, he made a lot of pictures of his garden especially ponds. There are famous picture in Japan which is a series of water lily. He made about 300 works in 1902 to 1926 when he was over 70 to 86 years old. He is one of the famous French artists in the world. He made a foundation of French painting. And now we have a relationship between France and Kochi. I’m very proud of this and it’s a nice thing that we can enjoy the different culture and history in Kochi. Monet’s Garden divides into 3 types of gardens which is Water garden, Light garden and Flower garden. When you stand the entrance of the garden and go through the right hand gate, you are in Water garden. There is a small fall made of rocks. Then go through the step, you can see a lot kind of flowers by the narrow. It’s so colorful and you can enjoy different kinds of flowers in 4 seasons. At that time we saw dahlia and water lily. One of the most famous arts of Monet is a series of water lily. In this area you can enjoy his world. In this area there are some pounds. This is a reproduction of Monet’s garden in France. Monet loved water lily but he couldn’t see blue water lily in his life. In 1998 in Japan a staff of Kitagawamura bought some seedling of blue water lily and they succeed. 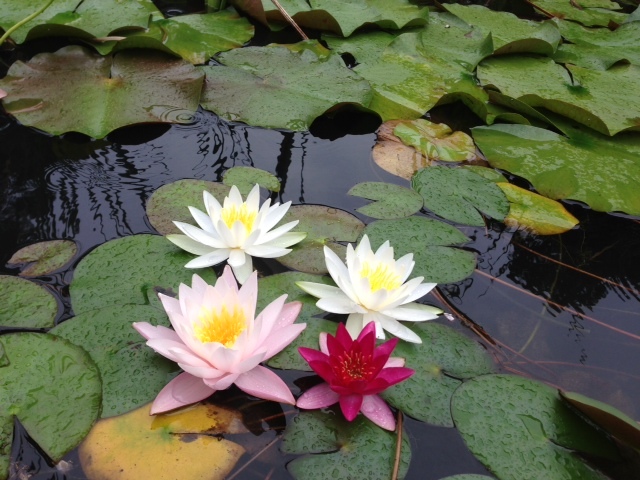 Now blue water lily became a symbol of friendship between Gverny and Kitagawamura. The sky is still gray and rain drops are hit on the surface of the ponds. But that makes the garden more tasteful. As for me the rainy day is special and lucky day for enjoying the water garden. After you pass the water garden, you’ll find the Light garden. There are olive trees, palm tree and exotic flowers. We feel that we are in forest in a foreign country. Our five sensory organs stimulated by the smell and landscape. This area is based on Monet’s work of the Mediterranean Sea. He went to Mediterranean Sea when he was 43 years old for painting and created some picture there. The common point of these works is “Color as Light” In this section, I find a mixture of nature of Kochi and exotic sense. Back to the garden’s entrance, now we are going to left side of the garden. There is another gate covered by plants like a tunnel go through that we are in a gallery. In this Gallery, there are some prints of his art and you can get information of this garden too. We are on the second floor so go downstairs. The first floor is gift shop. There are special product of Kitagawamura. For example Yuzu which is kind of orange is very famous and delicious. You can buy jam and sweets in here. “Look at the outside it’s beautiful!” my friends say. We move to terrace. A magnificent view opened out before us. We are impressed by the grandeur of the landscape. The mountains are deep green color and a little bit fog of rain. It is an amazing collaboration. Now we are time to enjoy the local foods. There are restaurant and café. 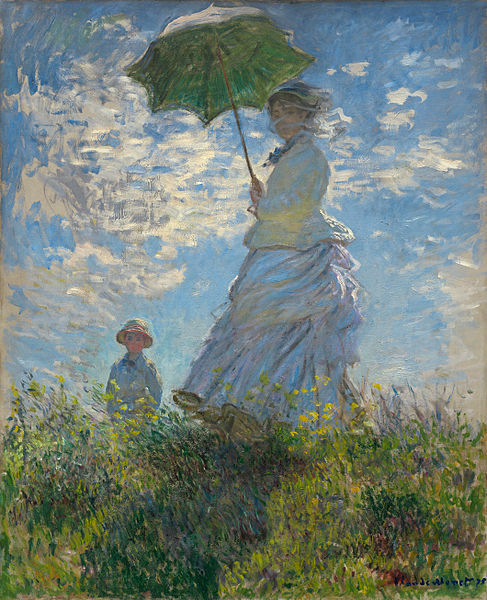 Monet was not only interested in painting but also loved cooking. This restaurant was designed by his kitchen in France. You can enjoy various foods which are made from local ingredients. Also there is a shop in outside of the restaurant. We bought ice cream with Yuzu sauce and handmade bread which is also Yuzu cream in inside. “Let’s move to that table.” The table is outside so we can enjoy the food with great landscape. Don’t forget to see the Flower garden. The Flower Garden is located in the cross over the terrace. The area is like an artist’s palette of painting. There are red, pink, yellow, white and purple. It’s so colorful and it makes me feel stand in the middle of flower field. Of course the flowers changing with season so I recommend to enjoy the various views of Flower garden in different season. “Mone no niwa” is not just a garden. This is the art world. There are some picture board in this garden, so when you find them please stand in front of that and image his feelings when he was painting this. 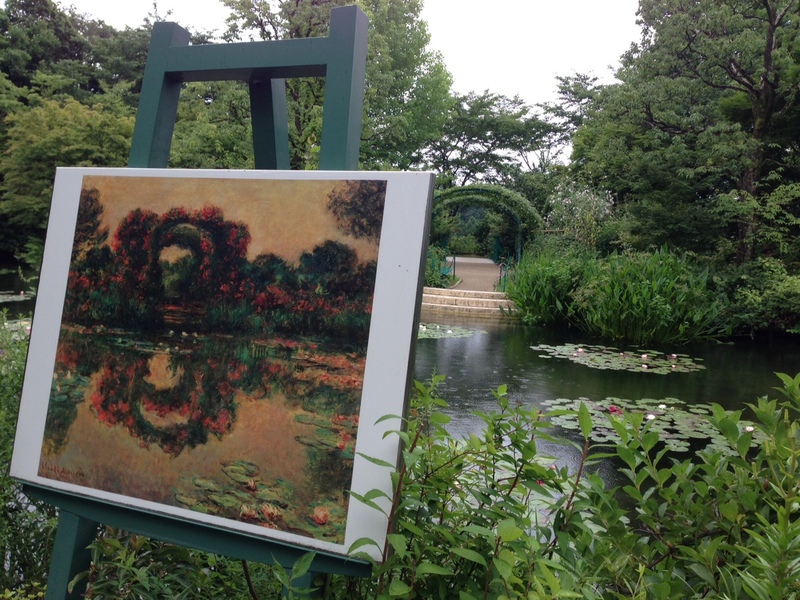 I recommend this way to enjoy this garden and Monet’s arts more. The weather and season don’t matter because this garden shows us a different face every day and I am sure you can find a new things every time you visit here. But you should go to see the water lily. The season is from the end of April to end of October. And if it’s rainy day you are lucky! I think water lily looks more elegant. I just remembered the trip we did together. As you mentioned, this garden made us think that we were in a Monet’s painting! I’m sure that every rainy day I will miss here. Thank you for the unforgettable memory and beautiful story.. I could remember amply that when we went to there. At that time, I didn’t have knowledge about flowers at all. But your article put knowledge in my memory of Monet garden. When I went to Muroto-cape by bicycle, I saw a sign of “Mone no niwa.” At that time, I was interested in it, but I had to keep on going for my goal so I didn’t visit there. Now I read your article, I really regret having done like that.